Presented by CIC National Capital Branch, Manulife, the Canadian Security Intelligence Service, Export Development Canada and CIPS. Paid event. In English. Registration is required. To register: click here. Seating is limited. Meals and refreshments will be served. 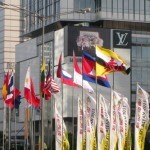 Southeast Asia has recently attracted increasing attention from Canadian business and government sectors. The word is out that Canadians should implant themselves in this part of the world to share in its dynamism. But what dangers lie ahead in the political currents that traverse Southeast Asia? Will Canada be able to strengthen economic ties without getting caught up in the great power rivalries that invade the region? As we open a new chapter in Canada’s foreign relations this is the time to deepen our understanding and think through the approach that Canadians from both public and private sectors should take to Southeast Asia. Speakers and panel sessions deal with security, trade, and Canadian strategy. Dr. John Ravenhill, a leading expert from Australia, who is currently the Director of the Balsillie School of International Affairs. Vikram Singh, former U.S. Deputy Assistant Secretary of Defense for South and Southeast Asia.